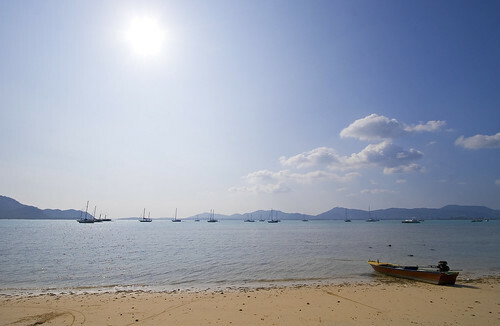 What's the weather like in Phuket in January? Having just blogged a review of Phuket Weather 2011, it's time to blog about the weather now - January in Phuket is generally quite dry, it's peak season for tourism too. Average rainfall in January is just over 30mm for the whole month, it's the second driest month on average after February. Well we've actually exceeded the average already according to my rain gauge - had some rain in the night on the 1st and again on the 7th, plus a bit yesterday and today. But aside from a few showers, and most of that in the night, January so far has been fabulous! Yeh, there was rain in the night on Saturday (7th) but the day - excellent... hot and sunny with blue skies, perfect! Our kids had a maths class, so my wife and I took a little drive into Phuket Town to drop off a laptop for repair and then on the way back through town, my wife asked "have you ever been to this temple?" 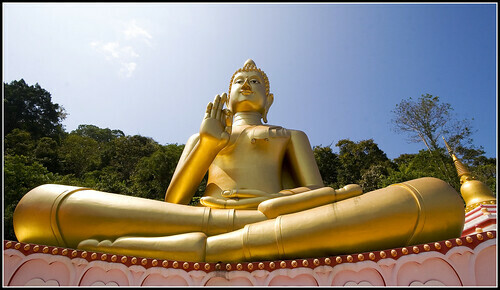 ... and somehow despite the fact that I like to blog lots of Phuket temples, I found myself at a new place, and WoW! 8th January "hot and sunny with clear blue skies again :)"
9th January "Phuket weather this morning - yes, sunny again :) Enjoy the day, everyone!" 10th January "It's another lovely sunny morning in Phuket :)"
11th January "Yes, another sunny day in Phuket"
The Tweets don't lie, it has been a beautiful week until today which was grey with some rain. Quite nice to have a cooler day for us locals. Coming up soon .. advance notice... 23 - 29 January is the Chalong Temple Fair, well worth a visit. And 28 - 30 January the Phuket Old Town Festival. These events are mostly in the evening. Just in case it's not obvious... Chalong Temple Fair takes place at Chalong Temple and the Old Town Festival takes place in Old Phuket Town.